One aspect to poker that really draws people in is that it's an easy game for new players to enjoy. You can have a great deal of fun with just a little background knowledge and even as a beginner you have the opportunity to win some extra cash. There are plenty of other inexperienced players to compete against that you may be able to beat and when the element of luck comes into play, you may even be able to beat players that are better and more experienced than you from time to time. An enjoyable experience is the only thing that some people are looking to achieve through poker. They aren't really concerned if they lose money overall; they just want to enjoy themselves and know that they at least have the chance to win every now and then. There's absolutely nothing wrong with this either, as even though it's possible to win money consistently with the right approach, it's still perfectly fine to just play recreationally if that's what you prefer to do. You may prefer to take the game more seriously, which is equally fine. There's a lot of information about the game that you need to know if you want to become a regular winner, but the rewards are definitely worth it as long as you are prepared to put in the required time and effort. Whatever your ultimate goal is in poker, whether it be to simply have fun, to be a professional player, or somewhere in between, there are several things that we believe you should do when you first start playing. 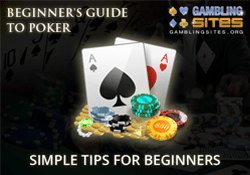 We have these listed below and they form what we consider to be the most important tips for beginner poker players to follow. These tips are all very simple, pretty easy to understand, and certainly something you can follow. They won't magically turn you into a winning player, but they'll certainly help start you on the right track if that's your long term goal. They'll even be of assistance to you if you just want to play poker for fun, so please take the time to read through them all, as we believe everyone will benefit from doing so. Before you sit down and start playing poker for real money, it's very important that you make sure that you know all the rules. This tip might seem extremely obvious to many of you, but it's nonetheless one that we think needs to be mentioned. It's all too easy to make a costly mistake if you don't fully understand the rules and it's hard enough to win money through paying this game without putting yourself at an unnecessary disadvantage. There's no excuse for not knowing all the rules either, as the rules aren't particularly difficult to understand. Some forms of poker are a little more complicated than others, but the rules are always relatively straightforward and certainly don't take a huge amount of time to learn. It's very unlikely that you'll be consistently winning money at poker as a beginner. You might have an incredible natural talent that makes you an instant success or you might simply get very lucky and go on a long winning streak, but the realistic likelihood is that you'll lose more often than you'll win when you first start playing. Losing money as a beginner isn't something to worry about too much, as many of the best poker players in the world probably lost when they started playing too. However, it is important that you don't spend money you can't afford to lose. You should set yourself a budget for how much you are prepared to spend playing poker and then make sure you stick to it. Learning how to play poker is relatively easy, but learning how to play it well is another matter entirely. There's a huge amount of strategy involved in the game and understanding it all requires a great deal of study. It can take years to fully grasp all the strategies required to be a truly accomplished player and even then there's always something new to learn due to the constant evolution of the game. The idea of having to study such a complex subject is probably not very appealing to you if you are new to poker. You may not even be interested in learning any strategy at all, particularly if you are playing the game for entertainment reasons. The truth is that you don't have to, as it's perfectly possible to have plenty of fun without knowing any strategy whatsoever, but our advice is that you should spend at least a little time learning the basics. Even just knowing basic poker strategy will improve your overall game immensely and help you make more educated decisions. You don't have to spend hours upon hours studying, but you'll almost certainly benefit from any time you do put into it. If you follow our previous tip and set a budget that you are willing to stick to and that's based on what you can afford to lose, then to some extent it doesn't matter what stakes you play at. There's a strong argument that you should stick to the low stakes as a beginner though and that's certainly what we recommend too. The simple fact of the matter is that you'll generally face a higher standard of opposition at higher stakes and we don't see the point in making things harder than they need to be when you first start playing and are still learning the game. There's still no guarantee that you'll win even at the lower stakes of course, but it's fair to say that you'll have a much better chance. At the very least you should be able to make your money last longer by following this tip. We believe that beginner poker players would benefit greatly by choosing to start out by playing online rather than live. Even though the game is fundamentally the same either way, things are far simpler online. You can play whenever you want without having to go anywhere, and there are fewer distractions. You don't have to worry about handling the chips and cards or trying to keep a "poker face." On the other hand, playing in a live environment can be rather intimidating as a new player. It's quite possible that you'll feel nervous about looking silly or making a mistake and this can easily have a negative effect on both how you play and your overall experience. One of the many advantages to playing online poker is that you can play at multiple tables at once. This can be very beneficial for players once they reach a certain standard, as it enables them to increase their win rate by playing in multiple games simultaneously. However, it's not really a great idea for beginners. Playing at multiple tables dilutes your focus and this won't help you develop your skills or properly learn how to play the game. Skilled players are able to make many of their decisions almost on autopilot, but this is something that comes with experience. As a beginner you should be thinking through virtually every single decision you make and also paying close attention to what your opponents are doing. You'll have a much better chance of doing so if you to stick to playing at just one table. Poker can be played in a variety of different formats. When you first start playing, we advise that you experiment with a wide range of these. You should certainly try a few cash games along with a few different types of tournaments and you should probably try both limit and no limit games. You may choose to specialize in a particular format once you've been playing for a while, but as a beginner we feel you should experiment with your different options. This will help you discover what styles you enjoy playing the most, plus you may also find that you are better at playing certain formats over others. When playing poker you'll regularly find yourself wondering how an opponent will react to your next move. For example, if you are considering making a bluff, then you'll probably be trying to decide if your opponents will fold or you might be trying to get maximum value out of a very strong hand while trying to decide if they'll make a bet when you check. You'll also frequently be trying to work out why an opponent has acted in a particular way. Why did they just make that big raise having only called on the previous betting round? Why did they just check the flop when they raised pre-flop? There isn't a poker player on the planet that can predict how their opponents will react with 100% accuracy or know for sure why they have made any given move, but there are many very skilled players in that regard and they are making very informed judgments. This partially comes with experience and a solid understanding of strategy, but it also comes down to paying close attention to the table. A lot of beginners focus primarily on their own cards and the bets they are making. While this is entirely understandable, it certainly would be considered a mistake. It's important to watch what's going on around you, as this can give you some valuable insight into how and why your opponents tend to act. You can then use this insight to make your own informed judgments when faced with tough decisions. As you gain experience as a poker player, you'll find that a lot of decisions will start to come natural to you. As a beginner, however, your instincts are unlikely to be enough. You need to go through a thought process for almost every single decision you make and that's not something you should rush. You don't win anything in poker for making quick decisions, so you should always take your time and try to make the best decisions you can. Our final tip is one of the easiest to follow. It doesn't require a lot of effort and it can actually be very enjoyable. There's lots of televised poker these days and a wide variety of poker videos online, which means there's plenty of opportunities for you to watch how the top players play. This can be very useful for developing your own game and it's something that we highly recommend doing.